The 54,535-acre South Jackson Mountains Wilderness is bordered by the Black Rock Desert Wilderness to the west and the North Jackson Mountains Wilderness to the north. Elevations here in the southern part of the Jackson Mountains range from 3,900' to the summit of King Lear Peak at 8,923'. 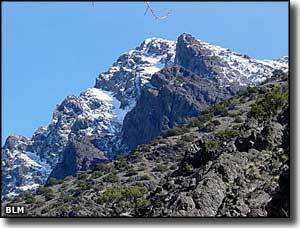 King Lear Peak is a favorite among the mountaineers and rock climbers in northwest Nevada. The dominant vegetation is sagebrush with greasewood and saltbrush in the lower reaches and juniper up above. The area is heavily cut with deep and rugged canyons, some of which contain streams that support riparian areas of willow, cottonwood and aspen. Some of these canyons carry names like Bliss, Alaska, Hobo and McGill. There is a short, cherry-stemmed road tunneled into the South Jackson Mountains Wilderness that leads to the mouth of McGill Canyon, making this a great place to start your hike. Hiking around out here you might come across mule deer, California bighorn sheep, mountain lion, pronghorn antelope, coyote and sage grouse. South Jackson Mountains Wilderness is part of the Black Rock Desert-High Rock Canyon Wilderness Emigrant Trails National Conservation Area. The South Jackson Mountains are high enough to have been an island in the waters of ancient Lake Lahontan. 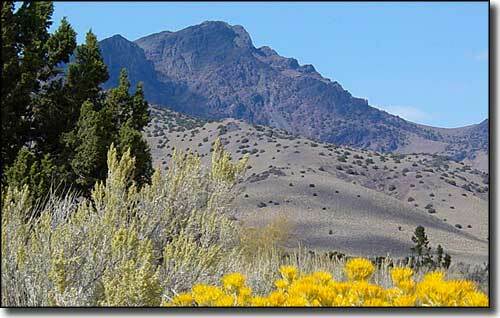 Many folks access South Jackson Mountains Wilderness by following the Jungo Road west out of Winnemucca for about 35 miles to the intersection with the Bottle Creek Road. From there they go north on Bottle Creek Road to Trout Creek Road. You can also reach the wilderness boundary by travelling south from Nevada Highway 140 on either the Leonard Creek Road or Bottle Creek Road.